This app is for GATE Computer Science and InformationTechnologystudents. 1. 20 previous year question papers from year2000 to2015-III. 2. Topic wise separation of questions. 3. Displayoftimer during tests. 5. Topic wise performance analysis. 6.Questionpallet for navigating and keeping track of questions. 8.AnswerKeys to the questions are provided. 9. Exam Information.10.Preparation guidelines. 11. After exam guidance. 12. Helpinkeeping the track of performance. 15. Exams, Admission andJobalerts. In all the papers of GATE examinations, thereare total of 65 questions carrying 100 marks, out of which 10questions carrying a total of 15 marks are in General Aptitude(GA).In the papers bearing the codes AE, AG, BT, CE, CH, CS, EC, EE,IN, ME, MN, MT, PI, TF and XE, the Engineering Mathematics carriesaround 15% of the total marks.The remaining 70% of the total marks is devoted to the subjectof the paper.These 30 marks (marks of General Aptitude and EngineeringMathematics subjects) makes huge difference in getting the goodrank in the examination, So Engineering Mathematics and GeneralAptitude subjects are very important.It has been observed from previous years question papers thatsimilar kind of questions gets repeated. So studying earlier yearquestions can make a significant difference in ones preparationefforts.All branches have same syllabus for subject General Aptitude.The Engineering Mathematics syllabus is almost same but not exactlysame.In this application we have made effort to bring you the earlieryear questions of subjects Engineering Mathematics and GeneralAptitude, so that studetns from all branches can get exposure toealier quesion on GA and EM of all branches. This is poosible dueto similarity in syllabus.This application has collection of earlier year questions (total880 questions) from branches Mechanical Engineering (ME), CivilEngineering (CE), Electronics and Telecommunication Engineering(EC), Electrical Engineering (EE) and Computer Science andInformation Technology (CS).The keys to all the questions are provided. One need to click on'Review' button after finishing the test to get the keys toquestions.The detailed solutions are provided for the branch of mechanicalengineering. For other branches the detailed solutions.You can save you performance in the form of certificate. The appalso keeps the record of your performance as you keep giving thetests. Click on 'History' to get the past data on Mock Tests.The syllabus for all branches is provided.This application is not complete, we will keep updating the appwith more useful information. We have taken lot of care whilemaking this application, but if you find any mistake please send usyour feedback. 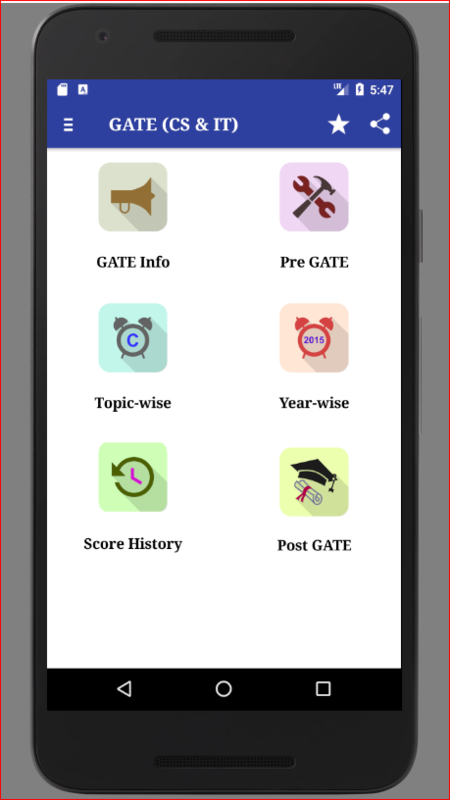 → Our Mission:• Help students to achieve academic excellence.GATE (ME & PI)+ application is made for the students who arepreparing for GATE mechanical (ME) and production engineering (PI)papers.→ App Features:• This is pro version of GATE (ME & PI) app, an India's#1 app for GATE preparation.• Experience real time computer based on-line test right on yourmobile.• Practice anytime and anywhere.• Virtual Calculator• Works offline i.e. without internet.• Enjoy pure android experience. No ads hence nodistraction.• This app will motivate you to study more, concentrate andachieve excellence.• Practicing previous years questions is utmost important as thenature of questions over the years remains same. We have providedprevious years question papers of Mechanical and production branchwith answer keys. There are total 38 Question Papers andmany more will be added in upcoming versions.• Detailed solution of year 2003, 2004, 2005 and 2014-setI and most of the maths questions are provided. Solutions toall the question papers will be added in upcoming versions.• Set your own topic wise tests and practice.• Compare your performance over time to see how you haveimproved.• See how many times you have attempted tests and how much % yougot in each test.• Performance analysis is provided at the end of the tests. Thishelps to identify weak subjects.• Information about GATE examination.• Useful tips on how to succeed in GATE.• Syllabus, books and other information on how to prepare forexamination.• Post GATE information like College Ranking, M.Tech. Programs,Resume tips etc. To make a successful career in mechanical engineering that too indesign or finite element analysis one must have strong fundamentalknowledge in structural/solid mechanics/strength ofmaterials/finite element analysis. This application will help youin undestanding the concepts in Mechanics of Materials and testingyour knowledge. In particular this app is useful for,1) Students appearing for written tests as a part of campusinterview process of core mechanical engineering companies likeRolls Royce, Airbus, Mahindra, TATA Motors, and so on2) Industry professional who are working in Design and CAEfieldpreparing for technical interviews3) Students appearing for various competitive examinations inengineering field like Graduate Aptitude Tests in Engineering(GATE), Indian Engineering Services (IES) etc.4) The application consist of Mock Tests from previous yearsquestions from Graduate Aptitude Test in Engineering (GATE) forMechanical and Civil Engineering Branches.5) Concepts on Stress, Strain, Elastic Constants, Deflection ofbeams, Shear force and Bending Moment Diagrams, Thermal Stresses,Thin cylinder Columns etc are summarized in concise form. This app is for GATE Computer Science and Information Technologystudents. Introducing notes: those who have been hand-picked by ourquality team for their in-depth effort for upcoming GATE aspirants.Main Features : 1. Previous year question with solutions 2. Topicwise separation of questions 3. Performance analysis 4. GATE ExamInformation 5. Syllabus for GATE 6. GATE Planner Other features :1. Suggesting videos, books that enhance learning cycle boosts yourbrain to learn & retain lessons. 2.Detailed paper analysis.3.Home learning app: Learn independently at home 4.The best placeto revise before your exams. This is an android application that gives different GATE ECEngineering Paper Solutions of each year. This is solution isprovided by different GATE Institutes of India. This is an android application that gives different GATEChemicalEngineering Paper Solutions of each year. This is solutionisprovided by different GATE Institutes of India. This application allows students of ICE GATE Institute to accessvarious course material and take up exams on their mobile phone ortablet.